the new iPad arriving India tomorrow! This entry was posted in Uncategorized and tagged apple, iPad, iPad in India on April 26, 2012 by admin. Okay, so the wait is finally over. 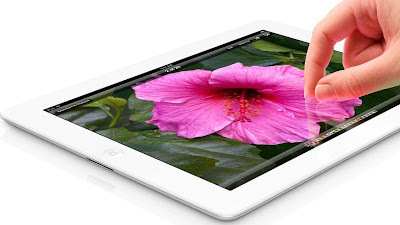 The new iPad (gasp, the revolutionary resolutionary Tablet) is finally here in India. Ok not yet, but by tomorrrow, it’s here in India. Man, really looking forward to it. Ah, the bad news (or rather not so good news) is that it starts at INR 30,500/-, which is the base model - 16GB wi-fi only. But you would do better to buy a 3G version (ummm, no 4G here in India, although I’d heard of rumours that 4G service has been tested/made live in Kolkata), which starts at INR 38,900/- for the 16 GB model. Also, the iPad 2 costs have been cut and starts at INR 24,500/-for the 16GB model. And that’s a lot – you have not seen anything as sharp or as fine as it. To really get the essence of retina display – you need to see it. I saw it on the iPhone and trust me, no other phone display has ever looked as good till date. Now I see pixels everywhere – even on the computer! So it’s just about looking good, is it? Well, yes – and that is remarkable. oh, it’s awesome and once you start using the retina display, everything else, even the devices that seemed so normal earlier (iPad 1/2, iPhone 3G/3GS) will look all pixelated. Retina display is seriously resolutionary – go for it. If you have any questions, shoot them at the comments. Be warned though, once you lay your hands on it, it will be very difficult to stay away from it. Darn, and just now @neosthrash tweeted that it’s been postponed to 30th April…will be able to tell tomorrow only! This entry was posted in iPad and tagged iPad, new iPad price in India, retina display on April 26, 2012 by admin. Yeah, so the Google drive is out, wow(after its announcement in 2006). And it has 5GB free storage, wow, wow. Although it’s not advisable to have some really personal file (yeah, that pic that only you have seen, or your bank statement) on any cloud service, the audacity of terms of Google is amazing. This entry was posted in Uncategorized and tagged cloud, do no evil, dropbox, google, skydrive on April 26, 2012 by admin.